So on my quest of eating healthier and making it a way of life for my family, I've been experimenting and trying new things. The latest "new thing" is quinoa. I'm on the bandwagon. I've been making it regularly for the past month, and I must say that it's a great alternative/substitute for white rice and a good way to give brown rice (what I usually use) a break especially seeing that brown rice takes about 45 minutes to cook. I won't bore you with the nutritional properties of quinoa--we all have Google, but I will say it contains a good amount of fiber and lots of protein! Remember my Key West Grilled Chicken post? Well, I made it another time using shrimp instead as well as substituting quinoa for the rice in my quick Jamaican style rice 'n peas. It was so delicious!! Even the hubs liked it. Plus, I love how they "pop" in your mouth while eating them. Or is that just me? I've also used a boxed quinoa blend that I picked up from the grocery. 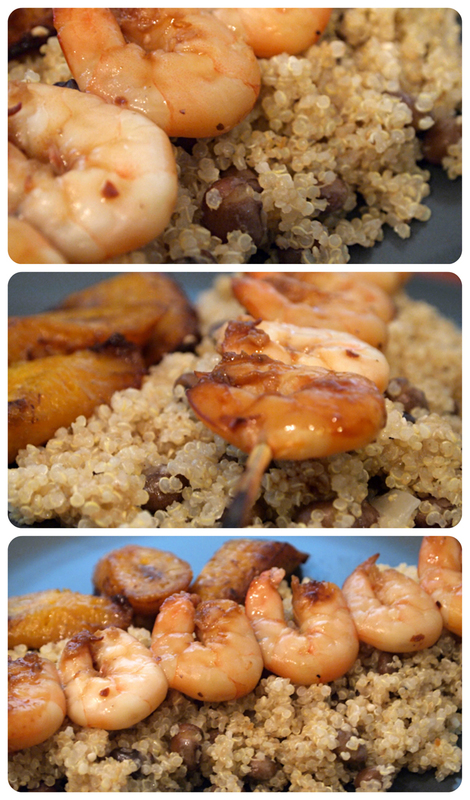 I really really enjoyed this-- almost more than my own quinoa n' peas that I'd made. I suggest you all check your local grocer to see if they carry it. I will be using this often as a side dish. They also have other flavors, by the way. So let me suggest to you, if you haven't already tried it, go get some quinoa! You can find lots of different recipes all over the net. The health benefits are worth it to try! Thanks for the review..I'm going to have to try it out. Always looking for tasty ways to add fiber and protein to my diet. I tried it before but I didn't like it. I don't think I cooked it properly and the one I got was dark brown in color. I will give it another try. I LOVE QUINOA! It's my go-to grain being a vegetarian, I have used it with patties, as rice, there's even quinoa flour so you can make desserts. It also comes in red variety for a little visual flare. Glad you enjoyed it!!! hmm, i'll have to try this! thanks for the suggestion! I love quinoa!! Actually I'm a bit obsessed, started experimenting for similar reasons now I'm totally sold. Love it it with dried fruits and nuts as well a quinoa cakes! Great post! Love quinoa! I cook mine with curry powder...yum!